2pm pick up drive 2 hours to Klias River, along the way you will see the countryside of Sabah. Upon arrival, high tea with tradition Malay cakes and cookies will be served. 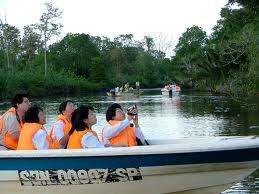 At 1630hrs, take the boat ride on the river in search of the Proboscis monkey and Silver Leaf Monkey. Also it will sight as well as varieties of birds, and monitors lizards. At night witness the glittering lights on tree top along the river banks. There are fireflies can be sighted along the Klias river banks. 1900 hrs, cruising back to the jetty for our traditional Malay Dinner prepared under the star light. PRICE INCLUDES: dinner, high tea, entrance fees, return land transfer, driver guide. EXCLUDES: Guide tipping (suggestion RM5 per pax per day for Malaysia market) and personal items.